Tattooing has been practiced in the United States for centuries. Most of the Native American people engaged in some sort of body marking, long before white men set foot on American shores. Some of the early white explorers and missionaries documented the cultures they were about to destroy, but not enough. Today we have to search for information to learn more about these ancient body decorations. 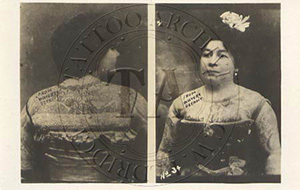 There is more than a little irony to the fact that after centuries of tattooing in North America by its natives, it was a German immigrant, Martin Hilderbrandt, who got the honor as the first professional tattooist. Of course there were others European immigrants that brought tattooing over from the old country, but it was Hilderbrandt that got the press. When he set up his shop in 1846, Hilderbrandt set the wheels in motion for the professional art form we know and love today. 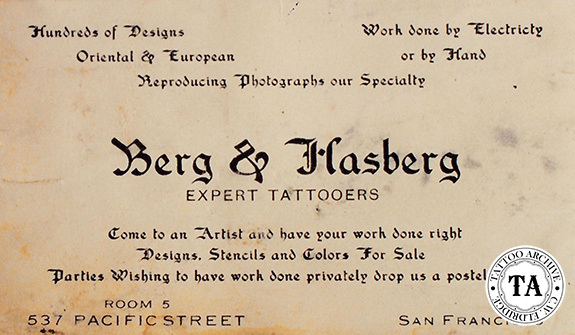 To our knowledge there are no pictures of Hilderbrandt himself, but we do have photos of his tattooing. 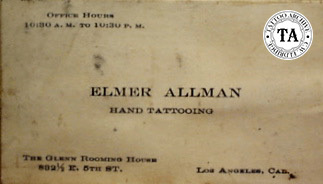 Many tattooists fought the change and would proudly proclaim on their business cards they did "hand tattooing". Others were more dogmatic and tried to cover all the bases, putting on their cards "hand or electric tattooing". Today hand tattooing is making a bit of a comeback in the United States, although it seems that almost everyday someone seems to come up with a new variation on the electric tattoo machine.